Established in 1985, Haryana Leather Chemicals Limited manufactures custom-made solutions, catering for the unique requirements of its customers in 25 countries throughout the Far East, Southern Asia, Africa, the Middle East and Europe. As the company expanded its PVC additives production line, Haryana approached Russell Finex for a high-performance grading solution for plastic powders. Haryana had been facing issues with final product quality, with oversize particles affecting the consistency of its powdered PVC product during packaging. Contamination such as this can compromise downstream production if not removed. To rectify this problem, the company sought a separation solution to be installed before packaging to ensure that no particles above 850 microns entered the bagging process. PVC is a thermoplastic used in the production of packaging, sewerage, construction, furniture and automotive parts and many other applications. During its manufacture, liquid PVC is made into a powdered form via a spray-drying process and is then screened to remove any oversize particles or foreign contamination before packaging. Russell Finex applied its expertise in powdered plastics and chemicals, recommending the Finex Ultima™ as the ideal solution. 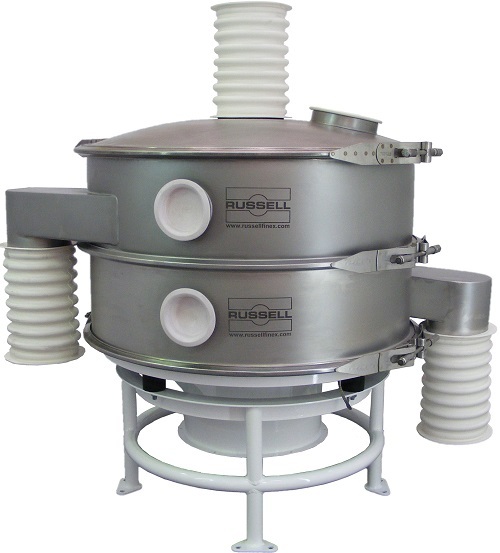 The Finex Ultima™ is a high-performance vibro screen separator, exclusively available for India, Bangladesh and Sri Lanka. This revolutionary screening machine is designed with the latest technology to deliver higher throughput with improved product quality compared to spring-mounted round separators. With the installation of a 30” Finex Ultima™, Haryana is now able to consistently achieve its desired particle size of PVC additive powders. In turn, the company ensures its customers’ demands are met both in terms of quantity and quality, meaning Haryana is more than satisfied with the machine performance and would certainly consult Russell Finex for future requirements. Contact us to learn more about the innovative range of sieving and separation solutions available for the chemical industry.